There's a war you may not know about going on in baseball: The old school vs the new, the "play the game the right ways" vs "stat geeks." This may be emblematic of a deeper cultural divide in these modern times but let's not get into that right now. 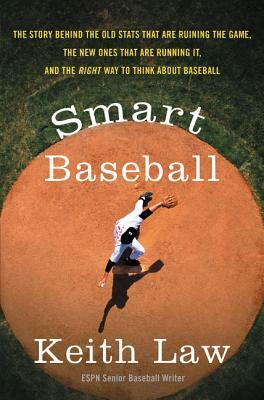 Keith Law's Smart Baseball is a thesis, a guide, and a clear line drawn in the sand. We've been thinking about baseball wrong ever since it's inception. Most of that is forgivable but now that we have the technology to measure literally everything in baseball, we ought to use it. Law is a national writer and prospect guru. His prose is snarky without being off-putting and this book makes a strong case for new information and stats enhancing baseball without destroying any of the mystique. Predictably Irrational meets Moneyball in ESPN veteran writer and statistical analyst Keith Law’s iconoclastic look at the numbers game of baseball, proving why some of the most trusted stats are surprisingly wrong, explaining what numbers actually work, and exploring what the rise of Big Data means for the future of the sport. For decades, statistics such as batting average, saves recorded, and pitching won-lost records have been used to measure individual players’ and teams’ potential and success. But in the past fifteen years, a revolutionary new standard of measurement—sabermetrics—has been embraced by front offices in Major League Baseball and among fantasy baseball enthusiasts. But while sabermetrics is recognized as being smarter and more accurate, traditionalists, including journalists, fans, and managers, stubbornly believe that the "old" way—a combination of outdated numbers and "gut" instinct—is still the best way. Baseball, they argue, should be run by people, not by numbers. In this informative and provocative book, the renowned ESPN analyst and senior baseball writer demolishes a century’s worth of accepted wisdom, making the definitive case against the long-established view. Armed with concrete examples from different eras of baseball history, logic, a little math, and lively commentary, he shows how the allegiance to these numbers—dating back to the beginning of the professional game—is firmly rooted not in accuracy or success, but in baseball’s irrational adherence to tradition. While Law gores sacred cows, from clutch performers to RBIs to the infamous save rule, he also demystifies sabermetrics, explaining what these "new" numbers really are and why they’re vital. He also considers the game’s future, examining how teams are using Data—from PhDs to sophisticated statistical databases—to build future rosters; changes that will transform baseball and all of professional sports. Keith Law is a senior baseball writer for ESPN Insider and an analyst for ESPN’s Baseball Tonight, focusing on all types of baseball analysis. Prior to joining ESPN, Law spent four and a half years working as a Special Assistant to the General Manager for the Toronto Blue Jays, handling all statistical analysis, and was also a writer for Baseball Prospectus. Law lives in Delaware.